A full bodied cigar with a strong aroma. 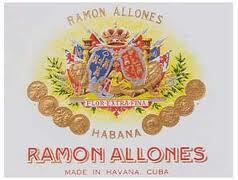 There actually was a Ramon Allones, who developed this brand way back in 1837. Originally from Spain, Allones (owner of the La Eminencia factory) was reportedly the first to employ bright, lithographed labels on his boxes, to help set his brand apart. Prior to nationalization, this lighter-bodied brand was owned by Cifuentes, Pego y Cia., also the owners of Partagas.